A Russian filmmaker wins the international animation festival LINOLEUM 2013 for the first time ever. For eight years straight now, Moscow has been hosting LINOLEUM — a unique contemporary animation and media-art festival. This year, the animated films, grouped by theme, were shown nonstop on several screens in separate halls at the Solyanka Gallery. 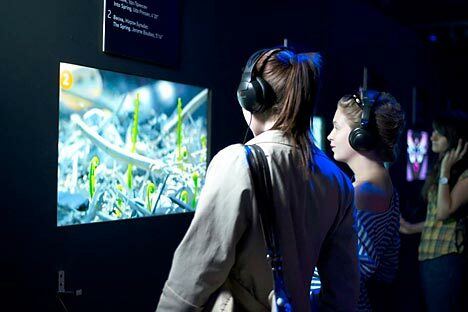 Guests could feel themselves quite alone with an artist's piece of work, sitting in headphones in a dark hall and completely engrossed in an animation story. The festival at the Solyanka Gallery lasted for almost six weeks, welcoming some 300 visitors a day. For all intents and purposes, contemporary animation is very close to artwork. Watching a modern animated film is hardly an easy or relaxing job. Having moved far away from cartoons for children or light entertainment, animation has matured into a meaningful visual art and a way for artists to explore global issues. Viewers were invited to contemplate and live through a lot of issues: extinction of animal species, anorexia, peculiarities of interpersonal relations, attitudes toward the arts, etc. This year, the key theme of the competition was “Re-Animation,” which many artists linked to the theme of war. The work presented rethought armed conflicts in Indonesia, World War II and the 9/11 terrorist attack. Two of the works — “It's Raining” by Anna Shepilova and “His War” by Bruno Collet — came in among the top three animation films. The Russian artist Anna Shepilova carefully mixed classic and computer animation to create a heartrending story of how war inevitably disrupts peaceful life. The French animator and filmmaker Bruno Collet went for the more realistic animation technique of rotoscoping (re-drawing over video, frame by frame). He told the story of a war veteran haunted by memories of the war that were dreadful and irritating, even during a peaceful family celebration. Other award-winning films included the 2-D short musical film “Desire,” from American filmmaker Yu Song Li, and Igor Zotov's “Cutie Duckling,” a moving story of a boy's affection for a rubber duck. With special booklets offered to each visitor to tick off the works that impressed them particularly, most votes were won by a journey-sketchbook-style animated film by the famous French director Bastien Dubois called “Portraits de Voyages” — twenty sketches illustrating life in various countries, with a short stories from its locals. In Dubois’ film, Russia is represented through a ride in the Moscow Metro; Pakistan is viewed through a kite-flying festival, with kites being relentlessly shot down; and Columbia presents a recipe for a special national dish made of ants. “Animation has something new, something to surprise, every year — both in terms of theme and technique. Last year, the novelty was original, stop-motion shorts and; some time before that, it was all about computer and digital techniques,” LINOLEUM festival founder, collector Mikhail Tsarev, said. “This year, it was a triumph of 'live' techniques: tracing over video footage, pencil lines. France and Germany, Estonia and the United States, and countries of Asia are very strong competitors. Animated films from Japan or South Korea bring out a wholly different staggering world! It is anything but easy for Russia to compete with such geniuses,” said Tsarev. “Our old school is valued and appreciated, it is true — but we have not produced anything new in the past 20 years. There's still a huge gap: The animated film industry lacks funding and specialized education,” the festival founder said.